I woke up at 4 and couldn't figure out what that "whooshing" noise was that I was hearing. I thought & thought & suddenly realized: Rain! It's been months since I heard rain on our metal roof - how cool! It's been coming down pretty steadily for the past 2 hours. Yay! I do, however, have a quibble or two, so read on! 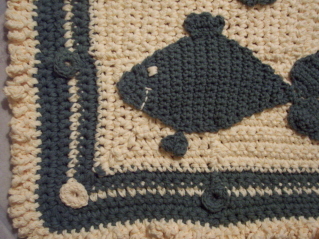 Pattern - Fish Bath Mat from Family Circle Easy Crochet, spring 2007. Hook - pattern calls for J, I went up to K.
Mods - None, but I really wish I had! In my opinion, the fact that the mat is put together in pieces is a design flaw. Now - I know why it was done that way. Proportion. 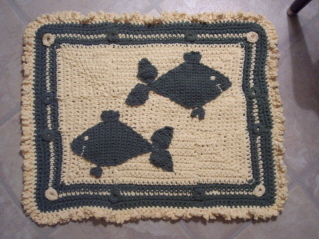 For example, if you start out with a chain, then crochet around, increasing at the corners to make a rectangle, chances are you aren't going to get a bath mat shaped rectangle. It will probably be too skinny. It's hard to get the exact number of starting chains correct in relation to the increases in order to make a nice, fat rectangle. (Ask me how I know. 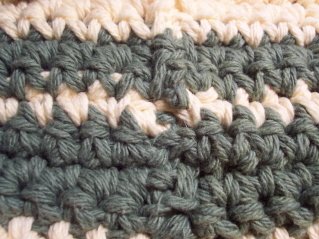 ::wink::) But - if I were doing this over again (which I won't be) I would make a smaller rectangle to begin - maybe chain 20 or so, then work back & forth in sc for about 7 rows before turning & working around that beginning rectangle. That would make the vertical line taller without increasing anything side to side. Then when you start increasing vertically and horizontally at the same time, you'd keep the correct proportion and you'd get something bath mat shaped in the end. 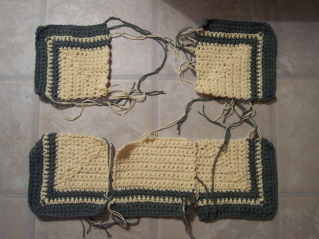 Of course, I'd have to play with the size of the beginning rectangle a bit but it's certainly doable and makes SO much more sense than all those seams and ALL of those ends to weave in! To file under "cool stuff:" I read a little over 100 blogs regularly out of the thousands that are out there. Obviously I can't keep up with all the cool stuff that people are coming up with on my own. That's why I count on all the bloggers I read to read other bloggers that I've not heard of & report back with gems of info. :) Case in point - Maryse's post about Pepperknit's Bainbridge Scarf. 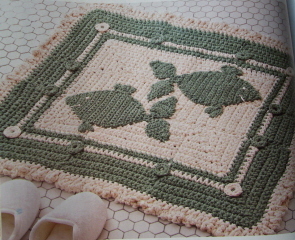 What a clever idea and great pattern! I love that scarf and want to make one pronto. It's Muench's Sir Galli and I'm going to use it for the Bianca Jacket pictured. :) You might recall that's been on my to-do list (which reminds me, I need to update my sidebar!) and I wasn't sure what yarn I'd use as a substitute. Willa Jean remembered & let me know about the sale. I so seldom make a pattern in the yarn called for (much too expensive!) so this is a real treat for me. :) The silk tweed feels lovely and the bag price was a darn right steal! Now - the only problem I have is that I've packed the IK 2006 fall issue! LOL I need to open up some boxes & dig it out. Of course, if I do that, I'll probably be casting on too. 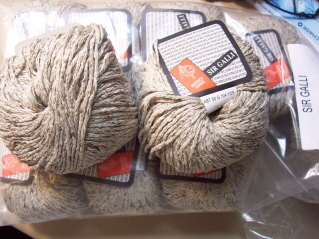 ::wink:: This yarn will make a wonderfully lightweight cardi. We're still waiting on our house offer - he's still crunching the numbers. A friend of Doug's came over yesterday to look at the house. He buys & sells for a living & had rentals for years, etc. What he told us was a little disheartening. To really spiff it up to sell, we'd probably have to put on a new roof, re-stucco, re-tile, etc. We'd be getting up to around $20,000 and we'd never get that back out of the house. Too many brand new ones going for a lot less just across the arroyo. The saving grace is backyard access and the huge lot. However, if we can unload it without putting any $$ in it, that's the way we've decided to go. It's really the luck of the draw on this one - to have the right buyer in the right place at the right time. Timing is everything. We've been told we should've sold it last year to get a really top price. But - I'm looking on the bright side. Even unloading it at a reduced price we're still making a substantial amount of money on a two year investment (although DH is pretty depressed about the whole thing) and we'll be out from under rentals and able to concentrate on finding our new house & fixing up this one to sell since this one experience has pretty much soured us on rentals forever. If we DID rent out this house, there are 10 times more things to get screwed up here than next door. DH & I couldn't imagine coming in here & finding it trashed too. It would just be too much. Sigh. Not sure whether I'll be working this morning - I do have a half day job starting at 11:30. I'm sure they'll be needing emergency subs, though. They almost always do! Have a great day & remember - it's almost the weekend!